A huge flood in Krasnodar territory has had more than 170 people killed, 96 houses destroyed and 3,300 left without property. Source: RIA Novosti / Ilya Pitalev. 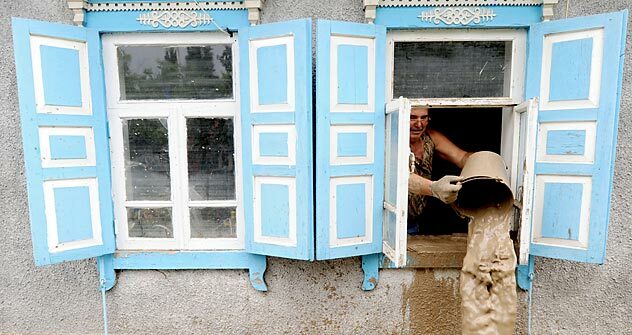 Flooding over the weekend in Krasnodar Territory was the result of extreme weather conditions, not the discharge of water from a local reservoir, according to Russia's Investigative Committee. The flood in Krasnodar territory that killed more than 171 people and destroyed thousands of houses was the result of extreme rainfall combined with the high level of water in the soil already, according to Vladimir Markin, a spokesman for Russia’s Investigative Committee, denying that water overflow in a local dam was to blame. During its investigation, the committee found that the water discharge was released in the "regular" mode. “There was not water overflow in the dam. Although water is supposed to be periodically evacuated , this didn’t result in tragic developments [in Krasnodar territory]. There were no mass water release and overflow,” Markin said. Russian Emergency Situations Minister Vladimir Puchkov echoed Markin, confirming that the flood could not have been the result of water discharge from the dam of the Neberdzhayevskoye reservoir, which is located in the mountains not far from Krymsk. According to Gazaryan, the electricity was switched off before people could see the breaking news on local television. When the first information about the disaster appeared on July 7, many online versions claimed that the flood was caused by an intentional release of water from the Neberdzhayevsky reservoir. Sergei Mitrokhin, leader of the Yaboloko political party, was among those declaring that the reservoir was the source of the water. “Activists of Yabloko in Krasnodar found out that sharp rising of water in Krymsk was caused by emergency dumping from the Neberdzhayevsky reservoir, which is located nearby the city in mountains,” the party press service said, quoting Mitrokhin. He also noted that for long time the reservoir “was used in conditions which predetermine possibility of similar accident. It has no adjustable bottom descent. There is only the top flood dumping. Respectively, in case of sharp rising of water and big amount of precipitation there is no possibility of gradual descent of water.” Mitrokhin said that 10 years ago Krymsk experienced a similar, though less severe, flood. However, statements by Valery Ayzenstein, head of the department of hydraulic engineering constructions of the National Road Company, disproved Mitrokhin's comments. In an interview with NEWSru.co.il, Ayzenstein said: “Forming a stream with a 7 meter wave height within 10-15 minutes is only possible in case of sharp operation of an overlying reservoir (which is located higher). Judging by a technical characteristics of water-engineering system of the Neberdzhayevsky reservoir, we can state that the compulsory emptying of a reservoir is technically impossible there. All conversation on Krymsk's certain ill-intentioned flooding is fiction." According to the Russian Ministry of Emergency Situations, 13,000 houses are flooded, either partially are completely, roads are washed out and telephone lines are down. In some areas of the terrirtory, local authorities have shut off the electricity as a precaution. Workers from the emergency services will be at the flood site for at least 14 days. EMERCON Minister Puchkov gave instructions to the workers on the ground: “You have to pay attention to each street and each house. Pump the water from the basements if necessary, get rid of waste, help people. There are a lot of seniors in the region who can’t do it themselves." Puchkov added there are a lot of public organizations and volunteers helping with the aftermath of the tragedy. The minister gave special thanks to the Cossacks, who are native to the region and are helping actively. He also ordered the transfer of fire brigades and rescuers from other cities of North Caucasian Federal District. Experts are expecting difficult weather conditions to continue in the region, including additional rain and possible hailstorms. Based on information published at RIA Novosti, Kommersant FM, mchs.gov.ru, Russian BBC service, NEWru.co.il, Interfax, Russian News Service.